It has been 5 years since I last represented Melbourne Uni at the Uni Games. In 2001, I smacked some people in the head with a bamboo stick in the sport of Kendo. Ironically enough, this was also in Adelaide and I felt strongly that, since this may well be the last Uni Games (at least in this format) and since this may well be my last year at this uni, that I should have one last hurrah. This time, I represented Melbourne Uni in the sport of Athletics. 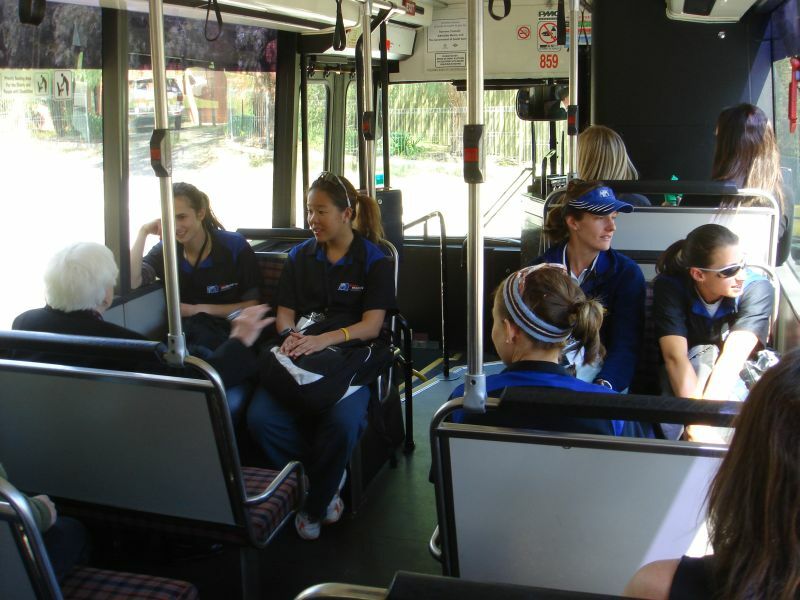 The distance squad converses casually as we ride the (free) public transport to the venue of the cross-country competition. Our passes entitled us to free public transport in all of Adelaide and free entry into numerous night-venues. 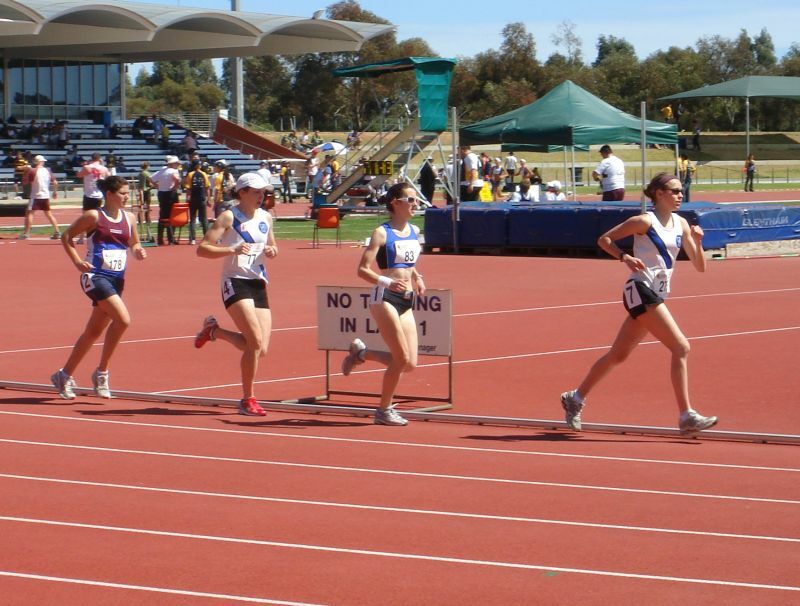 The girls went first, running four laps of the 2km loop. 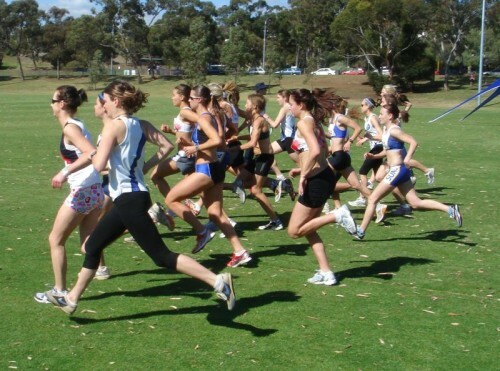 The course was described as being very “loopy”. This is them right at the start, the field spread considerably in the ensuing laps. 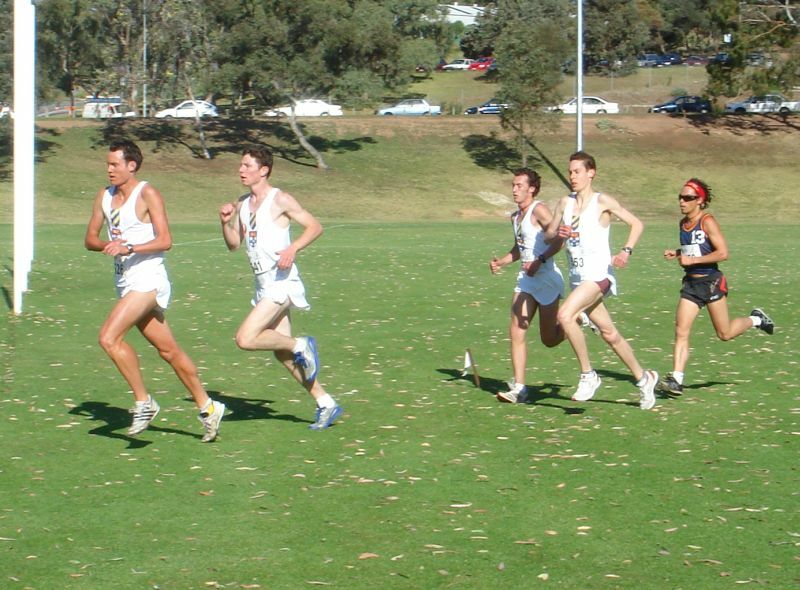 The men’s field began with four Sydney Uni runners and Russell. Russell, an Australian representative, eventually got the better of all four of them winning easily at the end of the men’s 12km race. 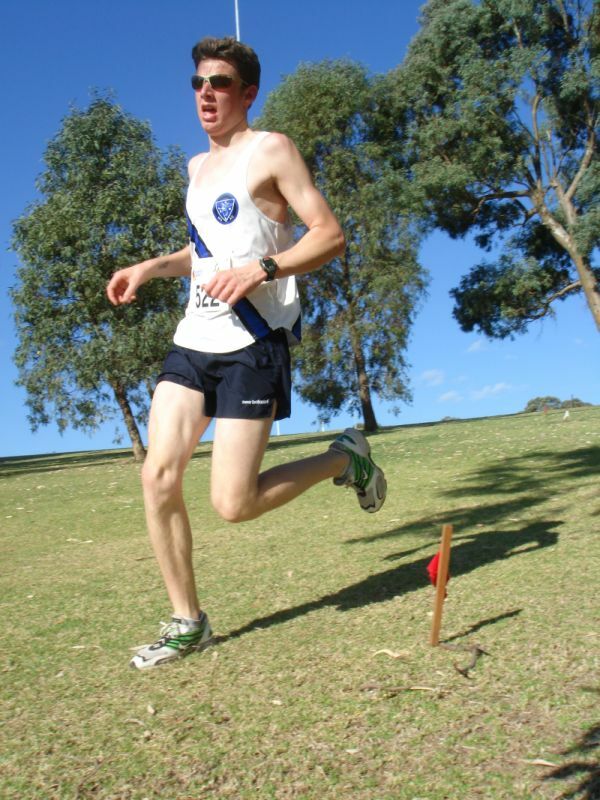 Melbourne Uni runner Cameron Macindoe strides around one of many bends in the course. 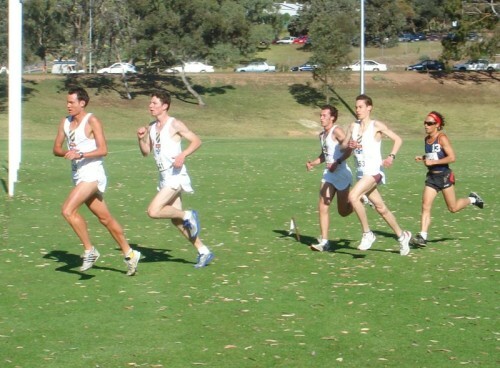 Melbourne Uni came first in the women’s division and second in the men’s for a comfortable win in the cross country competition. 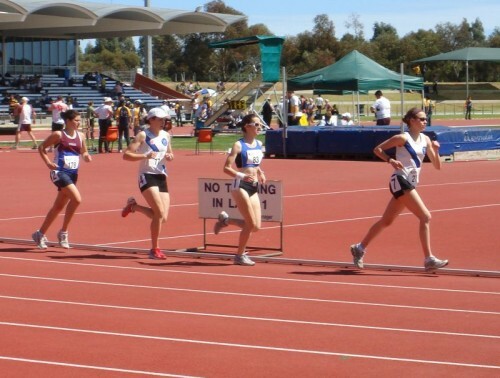 On Tuesday the track competition got underway and one of the first events which was on was the women’s 10,000m. Here we observe 2nd, 3rd, 4th and 5th. 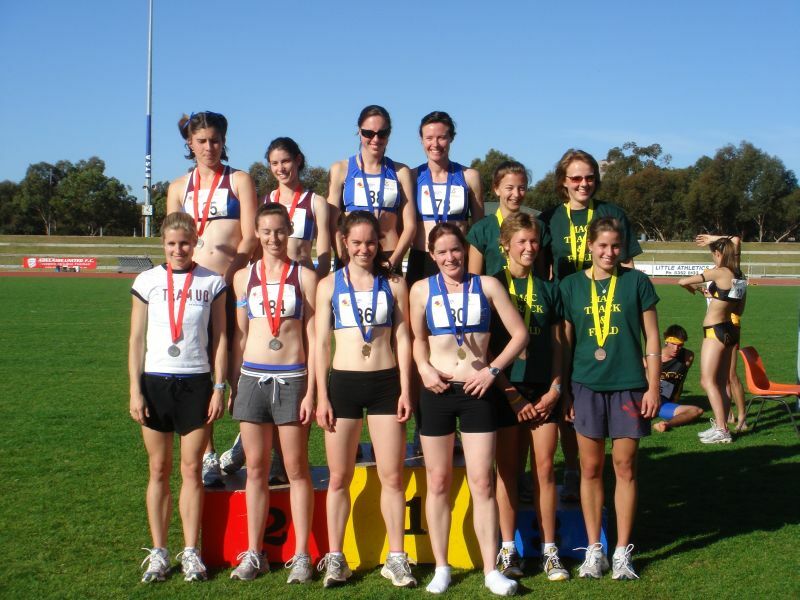 Alice Kemp (number 7) went on to win the silver medal while Alison Smith (number 4) took the bronze. Elise Aplin, sandwiched between the two, would have her moment later in the competition with a silver medal winning performance in the steeplechase. 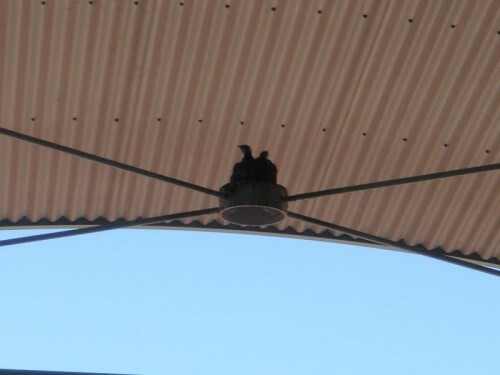 I’m not sure if anyone else noticed, but there was a birds nest above one of the lights in the stadium with little baby birds in it. Julie Bennell jumps into 4th place in the women’s long jump. 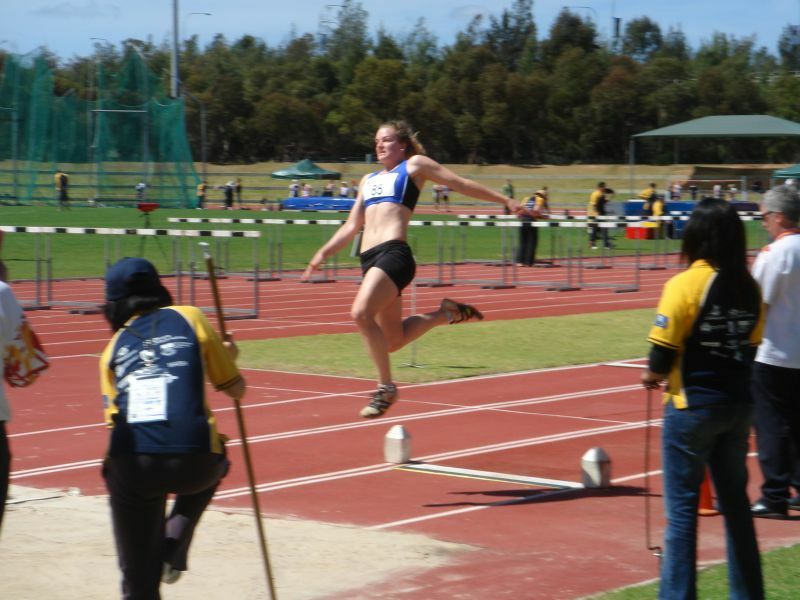 She also picked up a gold medal in the Javelin and two bronzes from discus and shot put. What an effort! The atmosphere at the track was fairly relaxed. 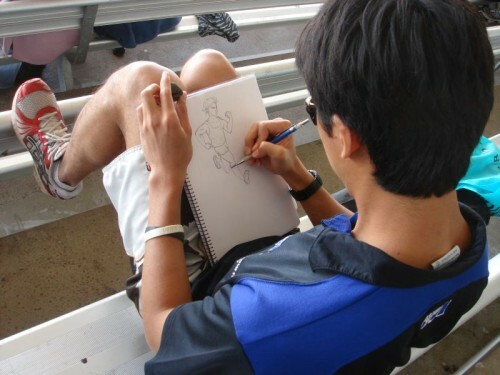 Here we see Iylia, one of the “dizzy runners” (athspeak for distance runner) sketching a runner. We felt very special because at times there were TWO (count them) masseurs at our service. Here they can be seen in an uncharacteristically non-busy moment. 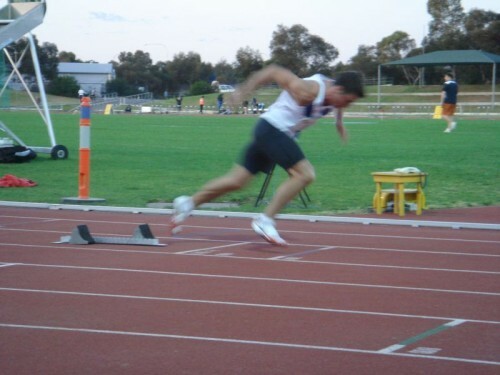 Towards the end of the program, due partly to bad programming and partly to some of our team succumbing to injury, many of our athletes had to run in more events than expected. 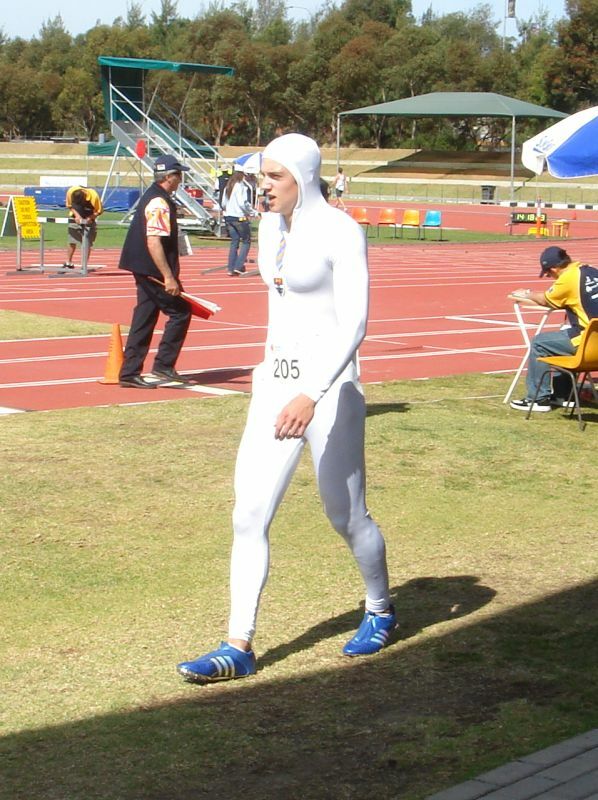 I, myself, ran in six races, four of which were in the last day of competition. 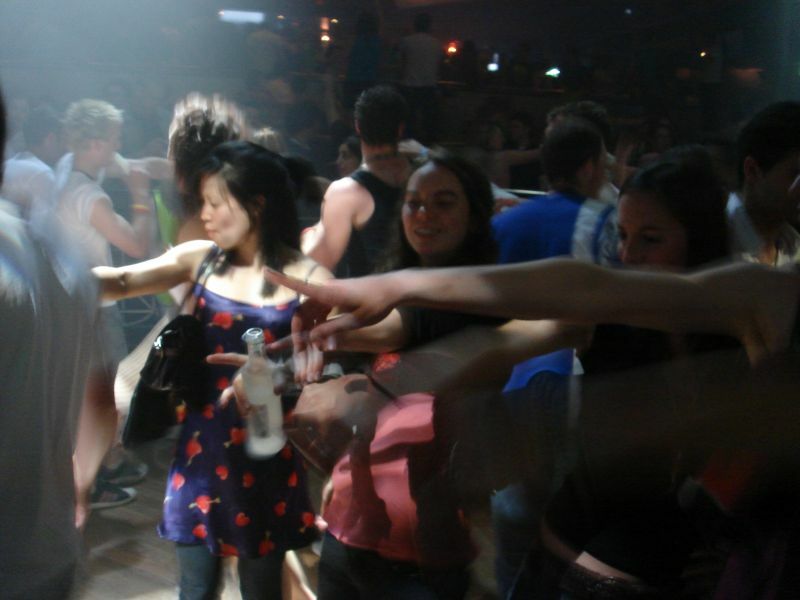 The massage service assisted us greatly in getting the most out of our limited recovery time. The girls were very successful in the relays, taking two bronzes from the 4x100m and 4x400m relay. An inspiring run from Celia Cosgriff in the 800m leg of the medley relay where she kicked past the UQ runner with 300m to go gave the girls a well-deserved gold medal. The men’s team wasn’t without some golden inspiration of its own however, with former schoolmate (we were in the same tutor group) Tom Cade taking the honours in the 400m hurdles. 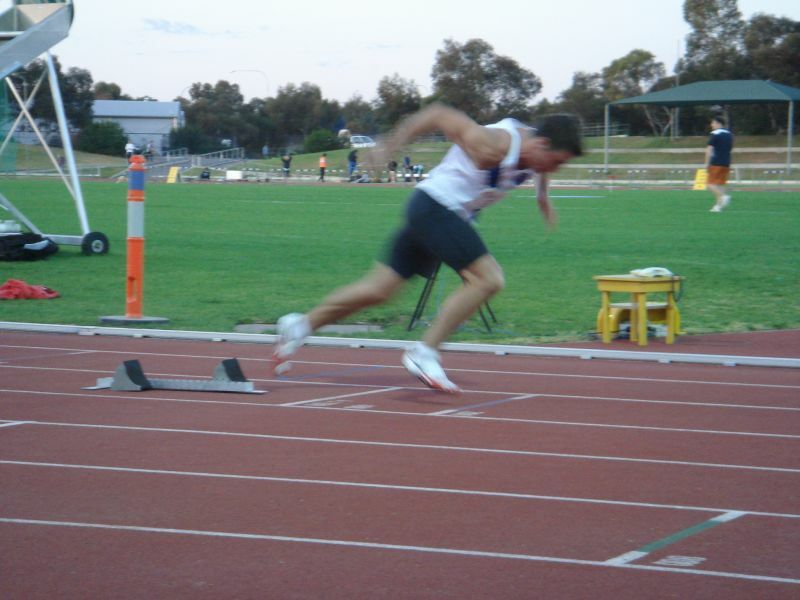 An impressive 53 second run saw him flash past second place in the final 50m of his race. 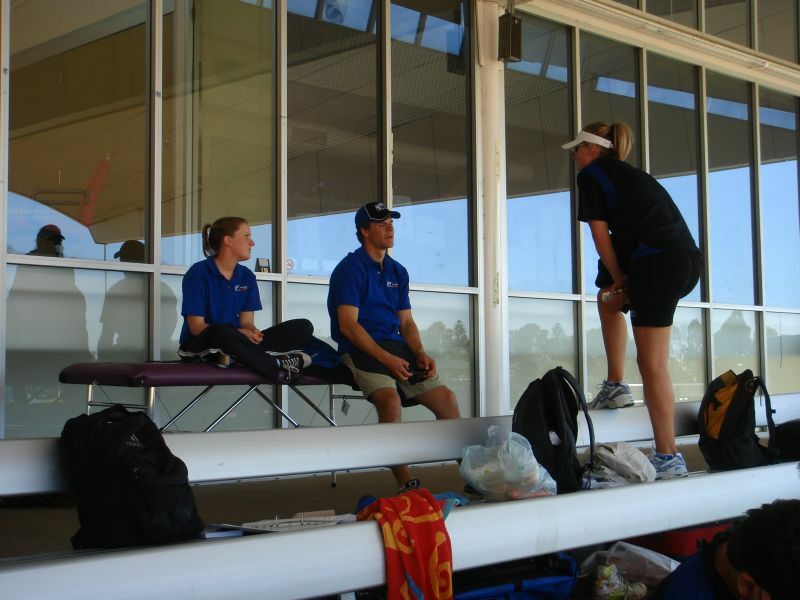 When all was said and done, the girls came within a hair’s breadth of snatching 1st overall from a very strong University of Queensland team. Sadly they came a close second. 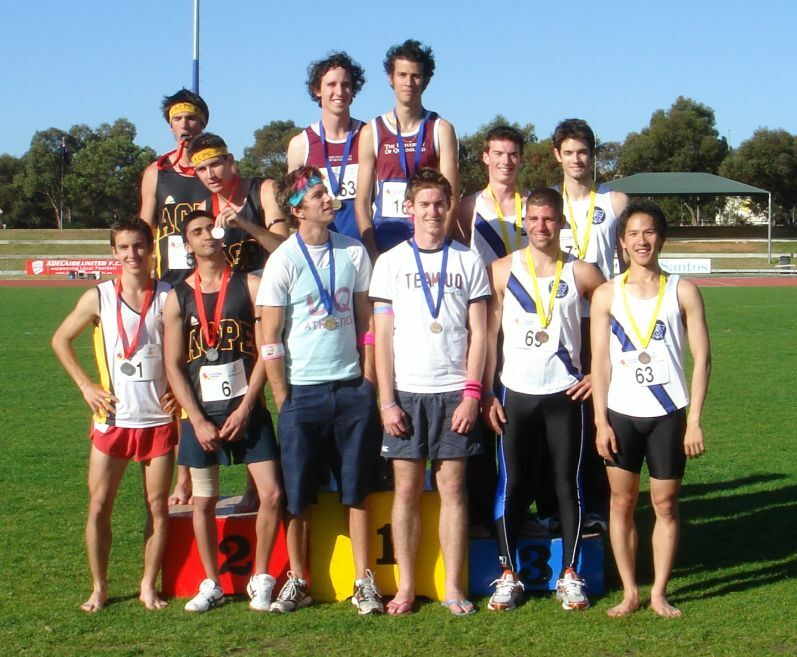 The guys had a similar situation, coming in 3rd place, ONE POINT behind the University of Sydney. I will, of course, hold myself personally responsible for the loss. Melbourne Uni Athletics overall came a very decent 2nd place behind UQ (who took the aths title for the 8th year in a row). This probably went some way towards Melbourne Uni’s overall victory at the Uni Games, and a convincing overall victory at that – rolling up runners up Monash and smoking them by a staggering 118 points and leaving traditional rivals Sydney Uni in the dust by a staggering 250 points. Straight after the competition (yes, STRAIGHT after, most of us didn’t even have dinner – a huge mistake), we gathered in room 510, played some drinking games and then headed out on the town (which, incidentally, was Adelaide). I was quite surprised how much energy everyone still had to go clubbing after a long and strenuous day at the track. 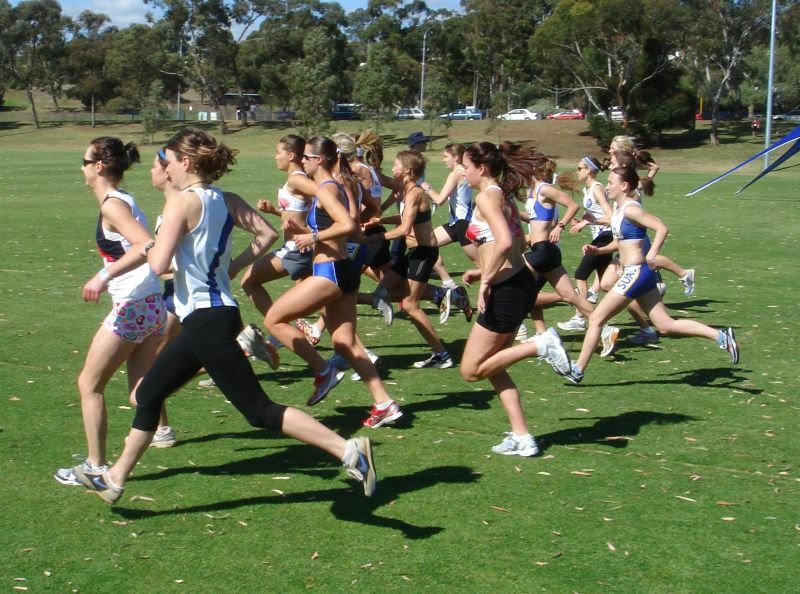 Then the realisation came to me that THIS was probably the training that I lacked to take my running to the next level. A good time was had by all (even those who overslept and missed their flights…) and, as far as I’m aware, we all got home safely. 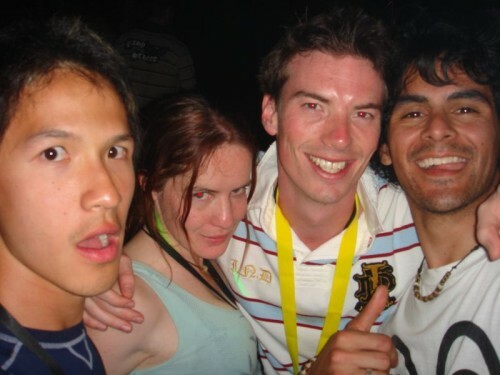 From L-R, Daniel Yeow (me), Celia Cosgriff, Andrew Boudrie, Mahamad Zeed. 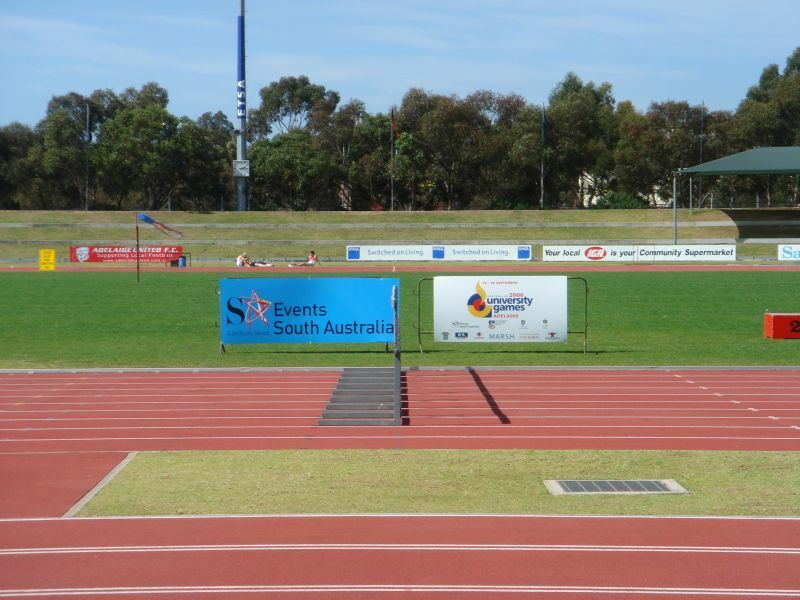 For those who are interested, results for the Atheltics and Uni Games on the whole can be found at the official Australian University Sport site.